GORGEOUS, SUN DRENCHED, 4 BR/3 BTH, 2500 SQ. 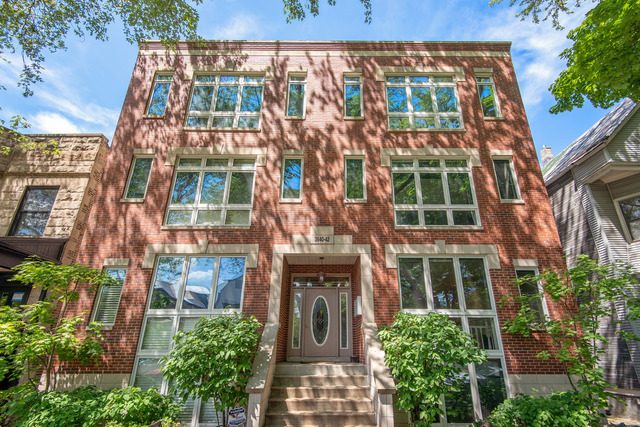 FT. DUPLEX DOWN W/ GREAT LIGHT & OPEN LAYOUT ON SERENE TREE-LINED, ONE-WAY STREET IN THE HEART OF THE SOUTHPORT CORRIDOR! STUNNING HIGH-END FINISHES THROUGHOUT. PREFERRED LAYOUT W/ MASTER + 2ND & BTH ON MAIN LEVEL. FEATURES NEW NATURAL STONE GOURMET KITCH W/ CUSTOM BACKSPLASH, ISLAND & BREAKFAST BAR OPENING TO LIVING RM/DINING RM W/ WBFP & FLOOR TO CEILING WINDOWS. HUGE MASTER W/ WALK-IN CLOSET & SPA BTH. SUN-FILLED LOWER LEVEL FEATURES LARGE FAMILY RM W/ FIREPLACE + 2 ADDITIONAL BR'S & 3RD FULL BTH. H/W FLOORS. CUSTOM LIGHTING & WINDOW TREATMENTS. PROFESSIONALLY ORGANIZED CLOSETS. SURROUND SOUND. LAUNDRY RM W/ SIDE-BY-SIDE W/D & STORAGE ABOVE. LARGE SEPARATE STORAGE RM. HUGE PRIVATE DECK IDEAL FOR FAMILY LIVING & ENTERTAINING. GARAGE W/ ELEVATED STORAGE ABOVE. LOW ASSESSMENTS. CONSCIENTIOUS, WELL-RUN, SELF-MANAGED ASSOCIATION. WALK TO PARKS, COFFEE SHOPS, RESTAURANTS, SHOPPING, BARS, THE EL & ALL THAT THE SOUTHPORT CORRIDOR HAS TO OFFER! Directions SOUTHPORT (1400 WEST) TO WAVELAND (3700 NORTH), WEST TO BOSWORTH (1500 WEST), SOUTH TO PROPERTY. Property information last modified by seller on Monday, June 11, 2018, 11:27 AM CDT. Information Deemed Reliable But Not Guaranteed. Unauthorized duplication, use, or linkage is prohibited. The information on this web site is for personal, non-commercial use and may not be used for any purpose other than to identify prospective properties consumers may be interested in purchasing. Monthly Payment Calculator results are for illustrative purposes only, not a financing opportunity; calculations assume a 30-year fixed-rate mortgage and do not include closing and other costs. Property Tax on NEW properties is estimated at 1.5% of Listing Price for payment calculation purposes; actual value may be higher or lower.